Register Your Book: Saved! Backing Up With Macrium Reflect - Ask Leo! Thank you for your purchase of Saved! 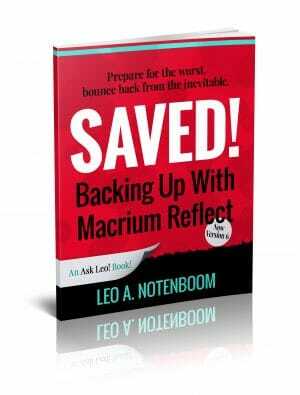 Backing Up Macrium Reflect! That’s all there is to it. Once you’ve completed checkout you’ll have an Ask Leo! account. As long as you’re logged in to that account — using the My Account item at the top of the page — you’ll have access to the Saved! Backing Up With Macrium Reflect Owners page. If that doesn’t work click on the Lost your password? link. Full in your email address (carefully, again) and click on the Reset Password button. Check your email; within the next 30 minutes you should get a message with a link. Click on that link and you’ll be able to set a new password. Login using that email address and password.